Just took these pictures with my new camera. Here you can see my Giridhari, sometimes known as Radha-Gokulananda after the place where he first came into my life, namely Gokulananda Ghat in Nabadwip. Shambhu Narayan Ghoshal, a Gadadhar-parivar bhakta with rasika credentials, took mercy on Madhusudan Dasji and myself in around 1981 and gave us the service of Giriraj. Dandavats to Shambhu Narayan's memory. He was one of a kind, as they say. This is my room's northeast corner. There is plenty of light. Actually, I have two rooms, of equal size, plus a bathroom and a kitchen. 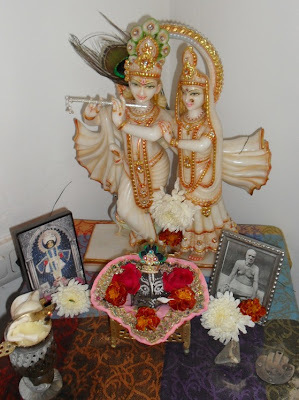 Swami Veda Bharati suddenly decided to give me this beautiful marble statue of Radha and Krishna a couple of weeks ago. They are carved out of a single block, and so they are not really deities in the classical sense. 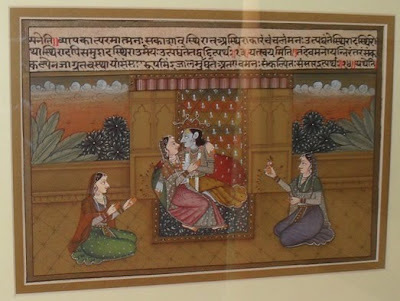 But I cannot treat them just like a work of art, so I have put them on my altar where I can drink in their Yugala-madhuri. Another picture of the same Divine Couple. 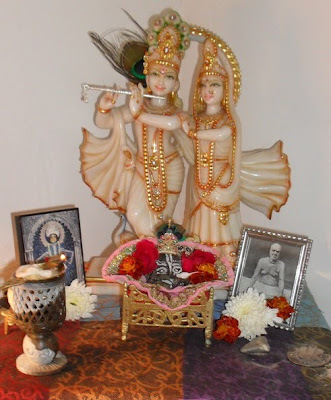 Dhameshwar Mahaprabhu and my Gurudeva are the other residents of the altar. 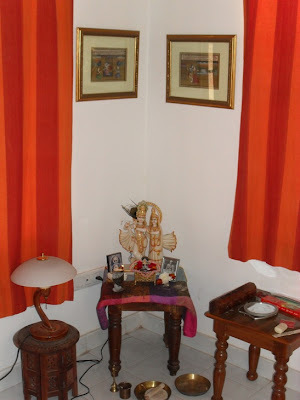 My old Gaura-Gadadhar picture had to be moved for want of space. This is one of three framed pictures I picked up last week in Delhi, quite serendipitously. This is an old illustrated manuscript, which from the handwriting I judge to be early to mid-19th century. The themes of the paintings are pretty standard, but they have been done with finesse and are easily distinguishable from the mass-produced knockoffs that are all over the place these days. The text strangely has nothing to do with the pictures. This page has some commentary to subhashita verses that I do not know. The others have three subhashitas per page, from no collection that I know of. I found one of the verses in Sanatan's commentary to the Brihad-bhagavatamrita (2.7.14) and is also quoted in Haribhakti-vilasa (10.259). In both places it is attributed to Vasistha. Association with the wise turns emptiness into plenitude, death into immortality and calamity into good fortune. 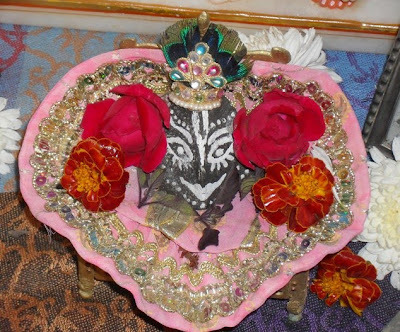 That is a beautiful Altar, Jagatji. The photo of Lalita Prasad Thakur is very nice - when was that taken? It looks like it is pretty old. Do you have a photo of Srila Bipin Bihari Goswami? I have always wondered what he looked like.